The Giffords 2017 tour runs from 12th May until 24th September. Great fun for all. The best in garden design. First of the big county shows, well worth a visit to gaze at wonder at what country folk do. A global celebration of all things gin with events and parties including The Ginchester Fête in Winchester. The fishing industry's answer to Royal Ascot, raising money for charity and The Fishermen's Mission. It’s been several months since my last ‘Riverbank News’ so lots to tell. On the subject of wild sea trout and wild salmon the news so far this season is not encouraging. The coracle sea trout fishermen in South Wales started their season early (1st March), although the season usually gets off to a slow start we do expect a regular and good supply of fish during April but it just hasn’t happened this year and the number of sea trout caught can be counted on one hand. Although the commercial wild salmon fisheries have not started their season yet indications already from rod and line fishermen suggest that salmon catch numbers will be down this year. The River Wye, which was hailed as a recovery river last year and recorded catch numbers not seen since the 1980s, has so far this season only caught half the number of salmon caught during the same period last year. In Scotland the news is no better, having myself been on two failed fishing trips already this year. Some may argue that this is simply down to my skills as a fisherman but in my experience salmon have no respect for what is tied to the end of the rod or the person holding it, and talking to gillies and experienced local fishermen there is genuine concern for the state of wild stock levels. May and June are the River Wye’s best fishing months and once these have passed we will have a better idea of how things really are for us locally. The local elver season is drawing to a close and we have probably only one more significant tide to fish before the season ends on the 25th May. Better news here though having had another relatively good season this year. As part of our commitment to sustainability and restocking we shall be siting numerous tanks of elvers as part of our ‘Eels in Schools’ project again this year in partnership with the South East Wales River Trust, and all being well culminating in another major release at Llangorse after the summer. Those that have visited us will know that we have a small shop with a great wet fish counter and small café attached. Since opening it has increased in popularity and people now come from far and wide to visit us but in all honesty it isn’t the most comfortable of experiences for visitors - hard seats and cold fridge-like conditions haven’t, it seems, deterred the many that have come and supported us, but things are about to change. Alongside the shop we had a traditional long stone barn which was all but falling down and this seemed the perfect site to create a proper visitor centre. What started out as a repair and reroofing job soon turned into a total rebuild. The barn was knocked down, every single stone cleaned, recut and re-laid using lime mortar. The result is a magnificent refurbishment that will act as a tribute for many years to the local craftsmen that have rebuilt it. Work kitting out the interior is in full flow and we hope to open end June/beginning July. What awaits visitors now will be a very different and, we hope, pleasing experience. A lot of thought has gone into making this a green and sustainable build with as near as we can get to negative carbon footprint. 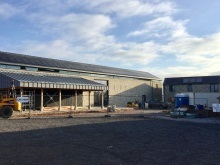 We have solar thermal panels on the roof of the newly built staff facilities which together with a ground source heat pumps system which will provide all the heating for the restaurant, shop and staff facilities. It will also generate 4 tonnes of hot water a day for us to use for wash down, hand wash etc. On the roof of the barn we have a photovoltaic solar panel system which will generate additional power for the barn and smokery. The same attention has gone into the design of the kitchen, and having seen the totally electric induction systems installed in several of our customers’ new kitchens we opted for a similar bespoke design. We are busy now putting together an enthusiastic skilled team that will be able to offer our brand of Gloucestershire hospitality. It’s taken nearly eight years of repeated planning applications and appeals but our own water treatment facility is now fully operational. It’s the only single-cell lagoon system of its kind in the UK. It was designed to be future-proof and currently processes all our foul and waste water from the factory, shop, restaurant, staff facilities and nine surrounding household residences. Solar powered this runs at an estimated cost of 75p a day. It’s already drawn attention from Welsh Water and the Environment Agency who, after visiting, think it is the perfect water treatment solution and expressed an interest in using it as a showcase model. The record prices reached before and after Christmas have seriously damaged the market. The swiftness and timing of the increases meant the market was forced to swallow a bitter pill. The reaction post-Christmas is that salmon is off the menu and prices have eased back slightly. Salmon now has competition! 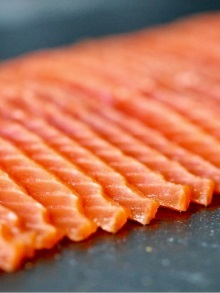 As of today MSC cod and haddock are 30% cheaper than fresh salmon fillet prices. The market is now very finely balanced. Prices are fluctuating up and down by as much as 10%. As prices ease in the UK, international buyers from the US, the Far East and Europe are entering the market and taking up that excess forcing prices back up again. Once these international buyers have replenished their reserves we may then see a more honest supply and demand price offering. When is your on line shop opening ? My daughter is in semi final south west junior chef and we are trying to source local (south west country) salmon as that is part of the criteria. I am finding this a little difficult and you were recommended. Is this something you can help me with or can you recommend. It is required for 12th July.